Snowed-under New Yorkers may not be the only ones getting gouged by Uber&apos;s surge pricing. A woman here in sunny California says she got stuck with a $357 Uber bill that she didn&apos;t see coming. While many people&apos;s counter-arguments focused on ill weather and the fact you can take the NY subway for $2.50, I live Southern California where neither of these factors were an issue. This past Saturday, I booked Uber (with no clear warning that surge pricing was in effect until I received the receipt) to take us just 14 miles (it&apos;s actually 12 miles, but our driver took us the long way, of course). The trip cost an outrageous $357. It wasn&apos;t snowing; it wasn&apos;t raining; it wasn&apos;t New Year&apos;s Eve. It just happened to be 7pm—not 9pm where most people are prime to go out nor 2am when bars are closing. There was absolutely no excuse whatsoever to be charged the surge price—not even their "supply and demand" cop-out justification, which falls short in this instance. On a clear night with near-perfect weather and at least 10 Uber vehicles within my proximity at the time of the reservation, there was plenty of "supply." I e-mailed Uber support 4 times and still haven&apos;t received a response. Then I went on Uber support and noticed they marked my case as "solved," even though nobody had gotten in touch with me. @Uber_LA I ALREADY DID!!! You charged me 8 times for one ride and will not contact me. UPDATE 5:30 p.m.: We&apos;re hearing other horror stories about surge pricing. 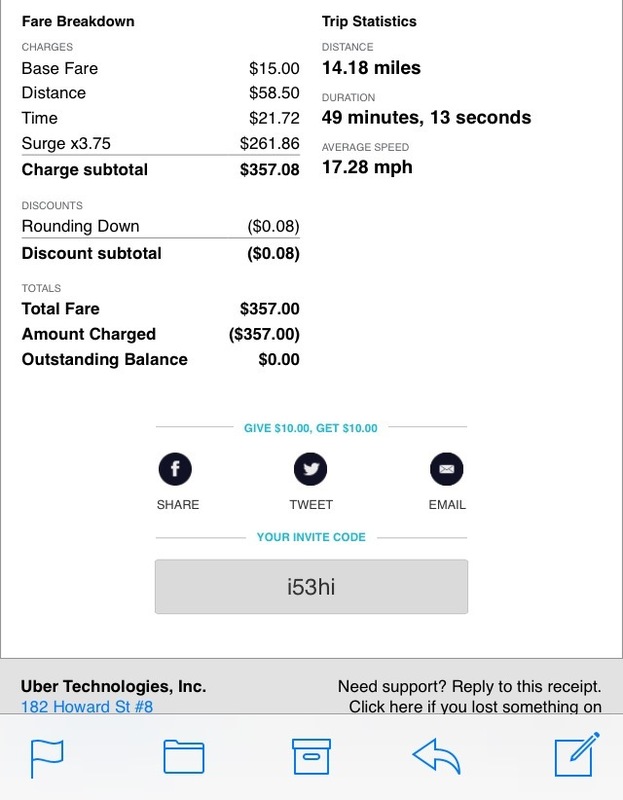 Lauren Gural wrote in to tell LAist that she was charged $161 for a ride that she took after going out on Saturday night. She says she never got a receipt, and so she tried to follow up with Uber and dispute the charge. A representative from Uber e-mailed her to say that she had accepted the surge pricing that was at 4.25 times the usual rate at 10:13 a.m. Gural said that was odd since she took the ride at 2:30 a.m. She&apos;s still working on disputing the charge since she never received a receipt.